Are you noticing that you are falling more than usual? Or maybe you feel unsteady? Falls are a common problem seen throughout the elderly population. According to the CDC, each year, one in every three adults age 65 and older falls. Falls can cause moderate to severe injuries, such as hip fractures and head injuries, and can increase the risk of early death. In addition to being the cause of many physical injuries, we find that the fear of falling alone causes many to alter their lifestyle as well as quality of life. Fortunately, falls are preventable! On a daily basis I see patients that use canes and walkers to ambulate and yet they still walk without confidence and in fear of falling. In fact, fear of falling causes people with an unsteady gait to spend more time at home and less time interacting with society. Furthermore, in addition to the mental toll this pathology plays, increasing time spent at home and decreases times spent ambulating leading to further weakness and atrophy of muscle tissues. Because of the consequences that are associated with an unsteady gait, it is very important to perform a yearly fall risk assessment, as well as initiating a fall prevention plan in those patients found to be at risk for falling. How do you know if you or a loved one is at risks for falls? Individuals with Vestibular Disorders, Chronic Ankle Instability, Arthritis, Stroke Imbalance / Drop Foot, as well as Peripheral Neuropathy should have a yearly Fall Prevention Examination as these populations are at increased risk for falls. Patients presenting with these disorders should always be assessed for risk of falling. At the very least patients and their loved ones should periodically ask themselves or family members: Are you noticing that you are falling more than usual? Or maybe you feel unsteady? If the patient answers yes to these answers, it is important to mention this to their doctor who will perform a comprehensive fall risk assessment. As well as a fall prevention treatment regimen based on exam findings. Fall prevention plans vary and are unique depending on individual assessments. Extra depth shoes with sufficient support are a mainstay in preventing falls but are no longer the only treatment options. Today, in addition to walking aids such as canes and walkers it has been shown that custom stability devices can prevent falls and even improve quality of life! Studies have shown that these devices are an essential aspect to a successful fall prevention plan. 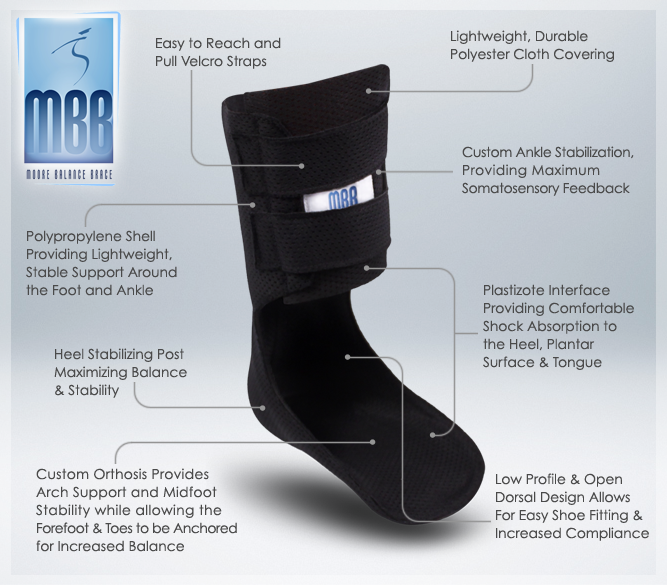 Moreover, stability devices, such as the Moore Balance Brace (MBB), have been shown to prevent falls without decreases in function. Research has shown that the MBB is effective in reducing the body's postural sway, stabilizing the foot and ankle when weakness and fatigue exist, and stimulating skin receptors providing feedback to the brain and improving foot clearance reducing the risk of tripping. In addition, the MBB is a light low profile device that is put into shows and easy to wear daily. In conclusion, PREVENTION of falls through improvement in function not only improves quality of life but also prevents serious injuries. Therefore, in individuals who are found to be at an increased risk a Fall Prevention Treatment Plan should be initiated. These treatment plans at a minimum should include a stability device, such as the Moore Balance Brace, as well as a Physical Therapy regimen to increase strength and improve gait. Many patients think that unsteady gait is an expected occurrence with increasing age. However, canes and walkers are no longer the only option in fall prevention. If you think you or a loved one maybe at risk for falling make an appointment with your podiatrist right away. Our patient was suffering from pain in their feet. Once they got their orthotics, they can work, walk, and stand for a long period. Albert V.
Our patient was suffering with persistent burning pain and after treatment is up to walking 20 thousand steps. Frank P.